Pigsticks comes from a distinguished line of successful Pig ancestors and he thinks it must be time for him to make his mark. He declares that he will be an explorer, only he doesn't want to carry the bags. 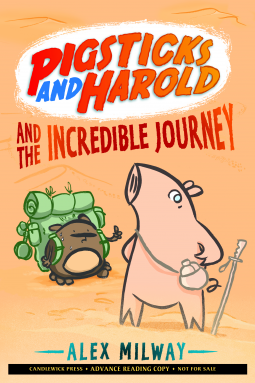 Enter Harold an unsuspecting Hamster who is persuaded to join Pigsticks in this difficult and dangerous expedition. Harold is promised cake, otherwise he wouldn't agree to come. This is a truly delightful story for beginning readers. The humor is extremely dry and in places just plain silly, with some great visual jokes provided by the cartoonish illustrations. But the plot is sweet enough that it will appeal to parents too. In the end this is a funny book about two real characters. Pigsticks is spectacularly confident and utterly incompetent. Harold is stalwart and easily bribed. I would like to see more adventures with this mismatched duo.